by PaulEMoz in "Diablo", "RPG", "Steam", "Torchlight", "loot"
I haven't played this a lot as yet, but I really need to mention it as soon as possible, because it's available on Steam for £7.49 until the end of 3rd January. And for that price, I would seriously recommend a purchase. Torchlight is, basically, exactly what you need right now if you're sick of the wait for Diablo III. It's a game very much in the Diablo vein, created by a lot of the minds behind Diablo. So the gameplay is exactly what you'd expect - an isometric-view dungeon crawler, with loads of enemies to smash and loot to find. Get 'em, boy... set 'em off. There's a bit of a difference, in that your character has a pet. At the start of the game, you can choose whether your companion will be a dog, or a cat. Your faithful friend will be at your side (well, I say that... I chose a dog. Christ knows what a cat will do. ), assisting you in your questing. It will attack or defend at your command. And if you feed it fish, it will develop special powers. Yes, even the dog. 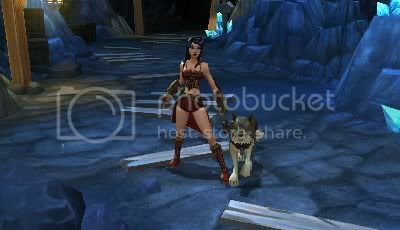 Torchlight is also a gorgeous-looking game. It's very simple to play, following the tried-and-tested pointing and clicking to move/attack/bring up inventory/character screens. It's a real pleasure, and should be keeping me occupied for a good length of time. There's a rumour doing the rounds that Diablo III was pushed back because of how good Torchlight is. Whether that's true or not, you know what you're looking at here, and it'll scratch that loot-collecting itch very nicely.